The Milky Way galaxy as imaged by the Murchison Widefield Array telescope from the SKA site in Western Australia. Credit: MWA Science Team. 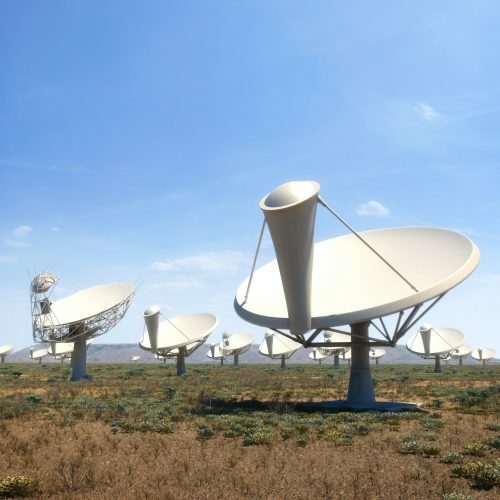 Radio Astronomy is the study of the Universe through the radio range of the electromagnetic spectrum, between 3kHz and 300GHz – wavelengths of radiation longer than the visible range that our eyes are sensitive to. Many objects in the Universe emit radio frequencies, including planets, stars, galaxies, black holes and remnants of The Big Bang. Unlike higher frequency radiation, radio waves can pass through clouds of dust and gas, including our atmosphere, so we can detect them easily using Earth-based telescopes. Radio astronomy has produced some of history’s greatest astronomical discoveries, including pulsars (rotating neutron stars) and the cosmic microwave background (the remnant signal from The Big Bang). Due to the very broad range of radio frequencies, the types and configurations of radio telescopes vary greatly. The most common and widely identified radio telescope design, the dish antenna, is used to detect high frequency (short wavelength) radio waves. Low frequency, long wavelength emissions are typically observed by directional antenna arrays, similar to a TV antenna. The angular resolution – the level of detail in an image – of a dish antenna is dictated by its size. To observe more distant objects and detailed features, one solution is to build a larger dish. However, even the 64m Parkes radio telescope (made famous by receiving images of the Apollo 11 moon landing) can only resolve objects around 1/3 the size of the Moon. Large dishes also pose great engineering challenges and have structural limitations. An alternative solution is interferometry, a technique that collects signals from multiple, separated radio antennas. The resolution of images formed from the antennas is determined not by the size of the individual antennas, but by the distance between them. The largest current existing radio telescope in the world is the Atacama Large Millimeter/sub-millimeter Array (ALMA) in Chile – an array of 66 radio dishes in the Atacama Desert which began observations in 2013. The Square Kilometre Array will complement ALMA by observing a wider range of frequencies as well as having 100 times greater collecting area. 1993: SKA project commenced with the establishment of the Large Telescope Working Group by the International Union of Radio Science, developing aspirational objectives for the forthcoming generation of radio astronomy. 1997: Eight institutions from six nations – Australia, Canada, China, India, the Netherlands and the US – formally agreed to collaborate in the development of technology for a very large radio telescope. 2000: The International SKA Steering Committee was established by eleven nations, including Australia. 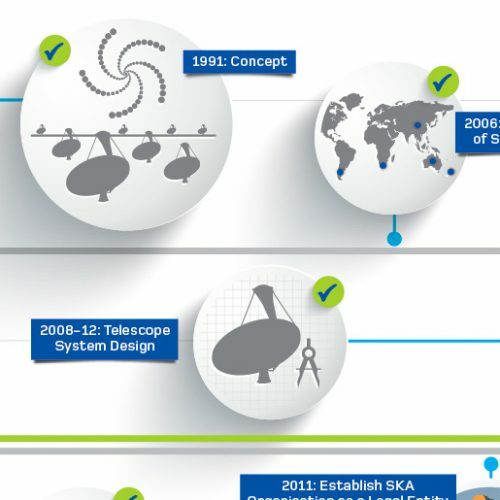 2000-2006: Early SKA development work conducted. 2006: Short-listing of potential sites. 2008: Commencement of the SKA preparatory study (PrepSKA). 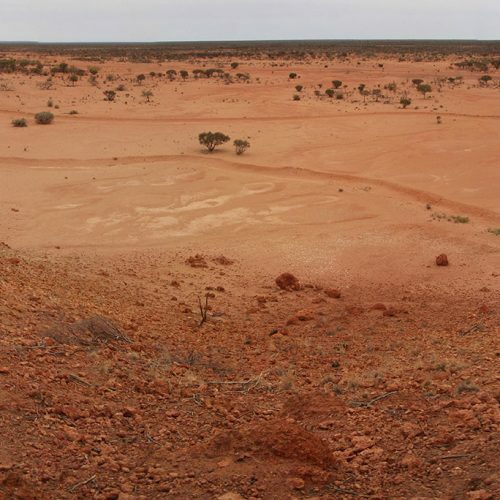 2012: Selection of the SKA host sites – Australia’s Murchison region was awarded the low frequency and survey components and South Africa’s Karoo Desert was granted the mid and high frequency components. 2013: SKA Design Consortia commence design of telescope components, including the low and mid frequency aperture array, dishes, the science data processor and the central signal processor. 2016: Prototype systems deployed and critical design review conducted – SKA Phase 1 construction approval. 2018 onwards: SKA Phase 1 construction. Currently, 10 member countries are the cornerstone of the SKA, although 100 organisations across 20 countries are involved in various aspects of the development of the project. The 10 SKA Member Countries. Credit: SKA Organisation.